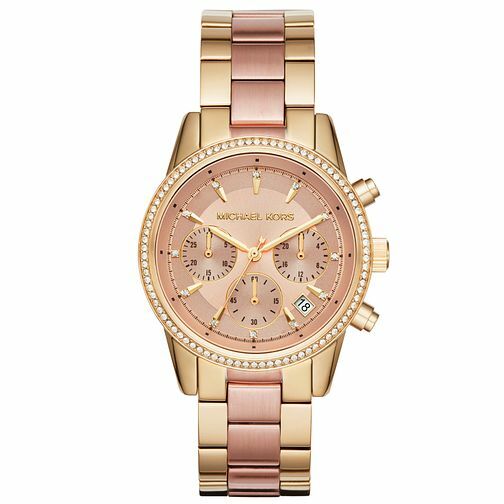 Acclaimed American designer Michael Kors opts for a stylish two tone appearance with this chic ladies' bracelet watch. The feminine gold-tone is highlighted with a rose tone dial and accents of rose ceramic on the bracelet, finished with an indulgent bezel of glittering crystals. Chic fashion timekeeping for the modern lady. Michael Kors Ladies' Two Colour Bracelet Watch is rated 5.0 out of 5 by 1.